Deciding which airline to fly on my 70th airline wasn't difficult. Since I was going to Thailand, I knew I could easily add a few new airlines to my flight logbook. Before this trip, I had not flown on any domestic carriers and Bangkok Airways even though, apart from Thai Smile, the rest have been around for some time. 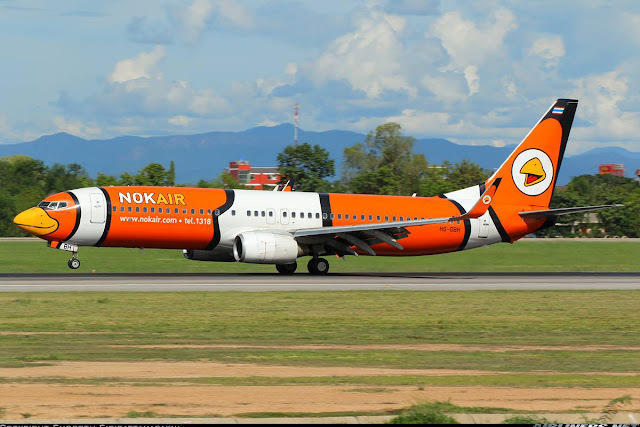 Nok Air was the first choice as I have always been attracted to its beautiful liveries! Here are some of the examples. Photos by the respective photographers from Airliners.net. 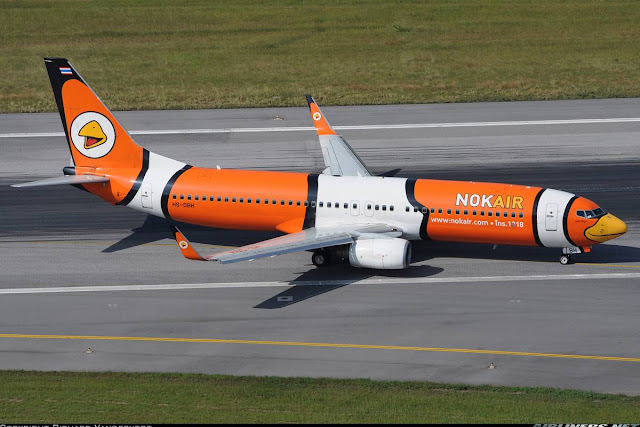 Flying on my 70th airline, I wanted to fly on this nemo livery and I got it! How lucky I am. Even the crew asked me how did I know I was flying on this. A big thank you to the crew for signing my card. Beautiful liveries, aren't they? I salute this airline for really putting in effort to paint each and every of their aircraft. Its not cheap especially when you have to take in consideration the regular checks these aircraft had to go through after a period of flying. Its easy to use and had no problems at all, doing the checking in. I wondered why does the seat number starts from row 33 and not number 1? You guys must be wondering the same, right? Anyway, decided to choose the one of the seats near the rear. Hoping that since there are so many Don Mueang - Chiang Mai flights daily, the rear would be pretty much empty. I stayed at the Phoenix Hotel which was quite far away from Don Mueang Airport but I decided on that hotel because I wanted to take some photos of the arrival (runway 19), however the traffic was using runway 01 and I could only hear aircraft roaring away to its destination. In the morning, I went to my usual favourite breakfast place, the folks there recognised me from my previous trips there. I had the pork meat noodles - absolutely delicious and it cost only S$2!! After checking out, I took the taxi to the airport. It took around 45 minutes to get there and the taxi took the route with toll-ways, which means you have to pay extra for them. On my way back, the taxi skipped past them so you can request whether you want to use this route. Altogether I paid about 380 bahts which I included tips for him. He was polite through out and deserved it. Once I reached the airport, I had some time before checking in, I went to the observation deck to snap some photos of the traffic. Do take note there are 2 sections of the observation, they are one end of the terminal from the other. Once it was time to check-in, I made my way through the crowd, joining the queue to screen my luggage before being allowed to check-in at the Nok Air's counter. 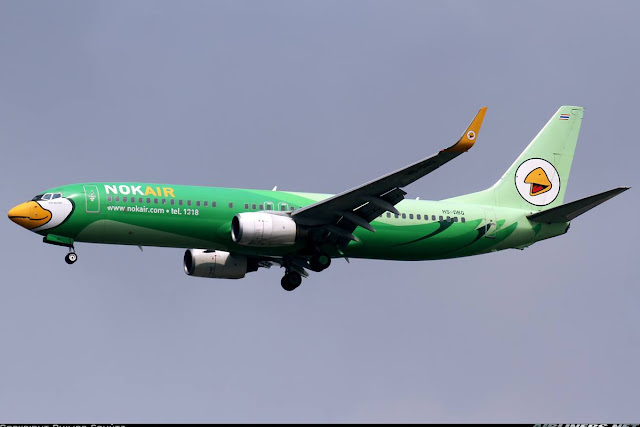 Nok Air has 3 rows of counters: one for frequent flyers, the other for Northern flights and last one for Southern flights, so do take note when you are there. Domestic flights open for check-in 2 hours before departure. The latest venture by Nok Air and Scoot - Nokair! There was a flight at night between DMK and CNX, the same route I am taking, unfortunately I couldn't change my ticket, perhaps next time. NokScoot has plans to fly to Singapore in the near future. It took me about 5 minutes to clear the check-in procedure. The 'supermarket' style boarding pass. Once my luggage was on its way to the aircraft cargo hold, I made my way to the air-side. R Airlines, how many of us are aware of this airline's existence? I spotted the company's Airbus A320 parking at a gate. I have to try this airline the next time I come back. My flight was located at gate 44, departing at 1630. HS-DBQ - one of the airline's newest Boeing 737-800 which is fitted with wi-fi system. It wasn't my aircraft to Chiang Mai. The walk from the immigration to my gate took around 10 minutes, the interior looks outdated but at least there are windows for us to to view the tarmac. Nok Air flies only domestic routes for now, to over 22 destinations in Thailand. There I was. Just remember that you have a flight to catch and don't wander off too far! When I reached the gate, there was no sign of my aircraft yet. So I went to a seat facing the gate 44, waiting for the aircraft to arrive. I saw HS-DBA - one of the oldest aircraft in its fleet taxiing in to the apron and I was just praying hard that that wasn't to be my aircraft! 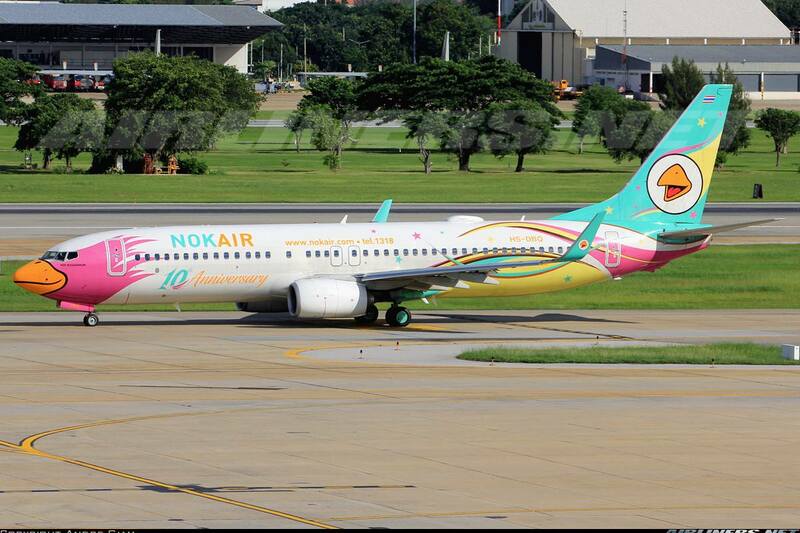 Nok Air has a non-winglet 737-800, HS-DBC. What are my odds of getting that aircraft? I have spotted that aircraft earlier on during my spotting session. 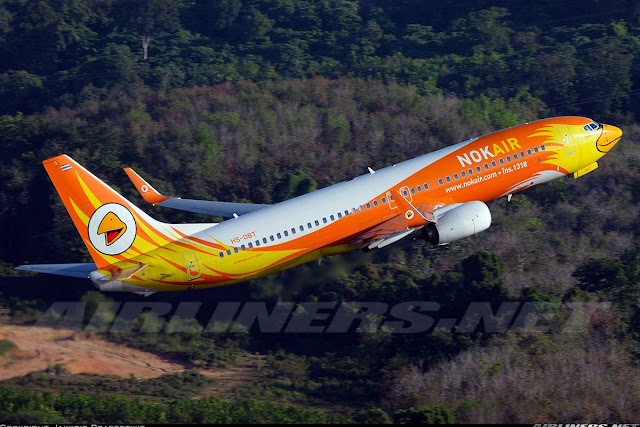 For this case, flightrader24 doesn't help much as I have no idea on the aircraft's rotation duty and besides this applications strangely doesn't track all of Nok Air's Boeing 737-800.
Credit to the respective photographers. Fortunately for me, this aircraft passed by my gate and parked at Gate 43 instead! Later on, to my delight something orange came around and it turned out to be my aircraft, the livery that I wanted to fly on!! Beautiful right? This livery! Its my favourite among all the different types. You can check out more of this airline's livery over here. Boarding started early and I was one of the first to board. Greeted by the friendly Thai crew, finally I feel really welcome unlike my previous flights. I heard positive reviews on the in-flight service and so far I was impressed. The crew greeted me while I made my way to the seat and one even offered to show me to my seat, but I declined. A good start, definitely! Got to my seat and it was very cramp comparing with other Low Cost Carriers. The seat pitch was miserable and the seat was narrower in width comparing to the A320s. Looking around the cabin, it's certainly showing its age - outdated looking cabin. Can you see how cramp it is for me? Horrible seat pitch! Luckily it was only a hour of flying, any more my legs would definitely protest! Unfortunately for me, the fight was almost full. All the rows of seats were taken up. This was my seat - always window seat for short flights. More passengers boarding and my face turned sour when my seat mates came! Old Boeing 737-800 Cabin, pretty uncomfortable especially with the tight legroom space. The legroom space at the emergency rows look better but I prefer the normal window seat so that I could take decent photos. Prefer sitting either behind the wings or in front of the engines. The cabin noise of the aircraft was pretty unbearable, that's why when I fly on the Boeing 737-800, I prefer flying on the ones with Boeing Sky Interior, preferably aircraft built from 2012 onwards. I got myself a T-shirt, should have gotten a polo-shirt as well. One thing I like about traveling to Thailand is there are Tourists Sim card almost everywhere and its very convenient as there is unlimited wifi for a number of days at a very low rate! The airline's in-flight magazine for December 2014. I was surprised when we were given a snack box even for a short flight like mine. The bread consists of beef and it was decent. Best in-flight service on my trip so far. The crew were friendly through out with smiles on their faces. When I called them to indicate that I want to purchase an in-flight duty item, they did it willingly and got back to me very quickly. That's what I call service. During preparation for landing, one of the crew came back to me and gave me my card and it was nice to see all of their signatures on it! After the flight, I managed to snap a photo with them. Here are some window-shot photos taken during the flight. I missed the landing due to a problem with the camera. The 'Nemo' livery on the winglet certainly looks beautiful. Parking besides its competitor, Thai Smile. This airline was flying me back to Bangkok a couple of days later. Finally, I got to try out this airline after many years of admiring the airline's beautiful liveries on different aircraft. I am very lucky to have gotten the one that I always want even though the aircraft I flew on was old. As expected, the service on board didn't disappoint even for a short flight like mine. However, its time for the older batch of Boeing 737-800s to be replaced and the airline has already ordered 8 Boeing 737-800 and 7 Boeing 737-8 MAX and have plans to add one more of each type at a later date. Hopefully, we see the stunning liveries on these beautiful birds. Flying with this airline, you can be assured of safety and reliability. I won't hesitate to fly with this airline again, its one of the better ones in Asia. Thanks for your review. 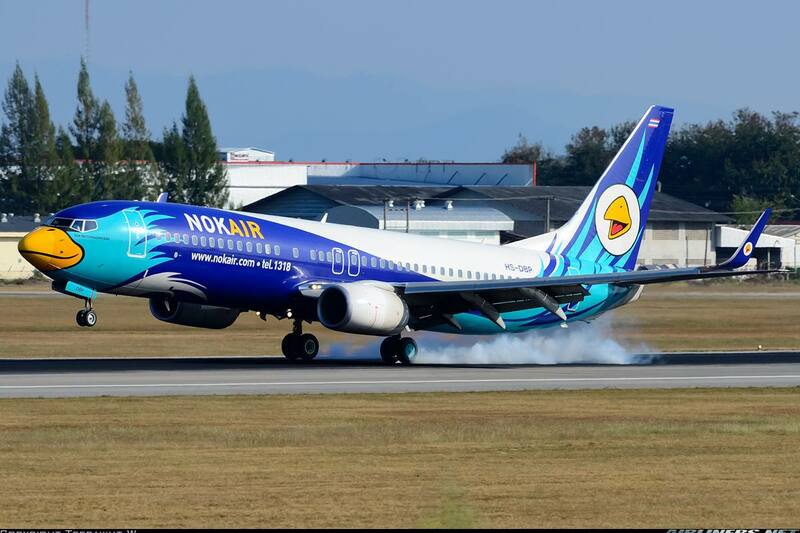 Nokair has internetional destination to yangoong (Myanmar).